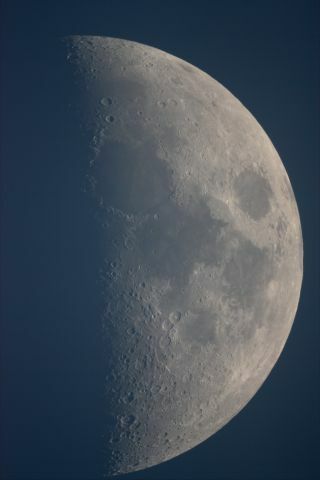 A daytime picture of the moon. Robert Vanderbei is a professor in the Department of Operations Research and Financial Engineering at Princeton University and co-author, with J. Richard Gott, of the National Geographic book "Sizing Up the Universe" (National Geographic, 2010). Vanderbei has been an astrophotographer since 1999, and he regularly posts new images on his astro gallery website. Vanderbei contributed these images to Space.com's Expert Voices: Op-Ed & Insights. A full moon image, with color saturation enhanced in photoshop to highlight the varying chemical composition of the Moon. On average, the moon's distance is 385,000 kilometers (240,000 miles) from the Earth. At perigee, that distance is about 350,000 km (220,000 miles), whereas at apogee it is about 406,000 km (250,000 miles). These pictures of the moon were taken with the same equipment: When the moon is close, it appears larger than when it is farther away. A full moon at perigee is called a supermoon (right, taken on Aug. 9, 2014), at apogee, a minimoon (left, taken on Feb. 3, 2015). Robert Vanderbei stands in his driveway with one of his astrophotography setups. Amateur astrophotographer Robert Vanderbei with his 10" Ritchey-Chretien from RC Optical Systems. The Dec. 21, 2010, total lunar eclipse captured by Robert Vanderbei.